Since LEGO made movies are all the rage right now, why not make a LEGO movie explain the philosophies behind Open Source. Seems to make sense. Posted on February 25, 2014 March 4, 2014 Author ShocmCategories F/OSS, Geek Stuff, Linux, UncategorizedTags SCALELeave a comment on Added photos to SCALE 12x – Southern California Linux Expo. Hanging out at #scale12x in Los Angeles today. Conference gets bigger and bigger every year. Posted on February 22, 2014 March 4, 2014 Author ShocmCategories F/OSS, Geek Stuff, LinuxTags SCALELeave a comment on Hanging out at #scale12x in Los Angeles today. Conference gets bigger and bigger every year. I got the opportunity to do another Scale11x interview, this time with Philip Ballew. Philip was a real pleasure to talk to and I even got the opportunity to meet with him in person since he is a San Diegan. Philip is a great guy, very passionate about Open Source. I am looking forward to catching his talks up in L.A. later this week at Scale. Video Interview: Philip Ballew | SCALE 11x. I tweeted and G+ about this story yesterday but I also wanted to add it here for anyone who might stumble onto it. If you thought Open Source was just about free software, limited to maybe something you would run on your desktop or phone, well you couldn't be more wrong. There is a movement of people who are applying Open Source philosophy and licensing to a scale you have probably never considered, Industrial Machines. The creation of physical working solutions for things like farming and agriculture. We are talking things like brick presses, bread ovens, tractors, saws, and cement mixers. I really encourage you to check it out opensourceecology.org. I’ve stumbled across this video several time, most recently on a blog post of an extremely talented developer and someone I’ve had the pleasure of working with. If you’re not a developer it can be kind of hard to wrap your head around what is being outline but if you stop thinking of what is being talked about as work and more as a something you enjoy doing it makes more sense. They make a great reference comparing work to music in the video but it could be anything, painting, gardening, working on your car. The thing a lot of non-developers (managers, bosses, what have you) don’t get is that some of us in the IT field do this because its what we enjoy doing. I wasn't always in IT, at one time I was in a completely unrelated industry and even during that period, my free time was doing some sort of development or general computer hacking. Not because it was going to move me up in the company I was working at but because it was what I wanted to do in my free time and has been that way since my Dad got me a TRS-80 for Christmas ’85. This is why Open Source Development works. Not because there is a big carrot hanging at the end of the stick, but because there is a passion and thirst for knowledge. The reward structure in Open Source is always difficult to explain to people but this video does a great job at capturing some of the attributes that does drive Open Source Development. Being an "Open Source" guy there is a certain stigma that goes along with that title, one being that everything you use has to be Open Source. Where I take great pride in the knowledge there isn't really any aspect of my digital life I couldn't do without an Open Source solution, I personally don't necessarily make Open Source a "requirement". I always look for the best solution and tool for a particular task, for me freedom and access to the code weighs heavily in that decision but is not the only parameters in picking a solution. Note: with the exceptions of OSX and the Microsoft products all solutions below do offer free versions of their products though I typically pay for the upgraded products. Dropbox (http://db.tt/AyOLUYV) – I have to be honest, I’ve used Dropbox for several years but it is always on my hit list to move to an alternative Open Source solution. There seems to be a new one that drops every month. When I get comfortable with the staying power and feature set that Dropbox offer, I will probably drop Dropbox. OSX (http://www.apple.com/macosx/) - This is really a decision of convince than anything else. There are typically a greater number “vendor support” desktop application that are not support on Linux desktops such as the previously mentioned Evernote. However OSX is BSD at heart and lets me retain a lot of the Open Source tools I am accustomed to on my Linux desktop including a very power command line and scripting ability. My OSX desktop also affords me the unique benefit of running virtualization software such as Virtualbox (http://www.virtualbox.org/) and allow me to run Windows, several Linux distributions, and OSX all on one physical machine. This is really nice especially when needing to do testing. 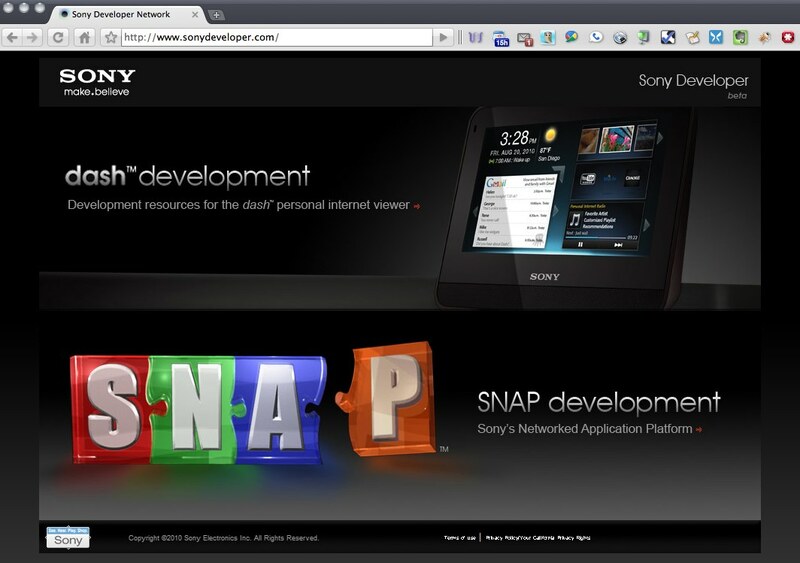 Last week Sony open the doors to a new web site, as well as a new approach for the organization, called Sony Developer . Sony Developer is meant to become a hub for Open Source development efforts for Sony Electronic products. "SNAP stands for Sony's Networked Application Platform and is part of an emerging new ecosystem for making downloadable applications available to networked devices like TV’s, Blu-ray Disk players and other Consumer Electronic products. SNAP is in the very early stages of development and has a lot of room to grow"
This will open an avenue that will allow developers to get their applications onto SNAP enabled devices such as televisions. SNAP is based on the GNUstep community, whose origin dates back to the OpenStep standard developed by NeXT Computer Inc (now Apple Computer Inc.) which also implements the extensions added by Apple in the form of Cocoa. The main language on GNUstep for SNAP is ObjectiveC and the SNAP development web site points a lot of great resources on ObjectC from beginners guide to optimization. Sony offers a guides and a SDK for download to start with your development efforts. It's mentioned on the SNAP web site that some good examples of applications would be "Games, Widgets (weather, news, traffic, etc), remote controls, social apps, media sharing apps, media players, home automation". Also according to the web site Sony will be hosting contest in the future for SNAP developers with prizes ranging from Sony televisions to Sony Walkman. Another section of the Sony Developer Web site will be the dash section, which is currently unavailable but from what I've heard should be opened in the coming weeks. dash is the Sony new Personal Internet Viewer. Developed with Flex, Sony is hoping to encourage and foster application developed on the dash product. Came across this great graph outlining some interesting facts around Open Source. Original article was called "Should Open Source Be An Enemy Of The State?" and is itself a good article discussing some of the paradox around recent suggestion made is US policies and Open Source. Update: @nanderoo on Twitter informed me the latest release of Pidgin addressed the Yahoo issue and in fact if you go to the Pidgin site there is a message "Yahoo issues are fixed in 2.5.8." I'll keep my post up for future reference but it doesn't look like its needed anymore. Have had a couple friends come to me and tell me they've been having a problem getting Pidgin to connect to the Yahoo service. I don't typically use Pidgin but fired up my Pidgin and confirmed there was a problem connecting to Yahoo. I was outside any corporate firewalls which help narrow down what the problem could be. Didn't have a problem logging into my Yahoo service using other IM clients like Adium so the problem wasn't the account. Did a little digging and found an old post talking about how you needed to configure the "Yahoo Pager Server" in Pidgin using an IP address instead on the URL of scs.msg.yahoo.com. The Pager Service can be found on the Accounts Screen->Yahoo Instance ->Edit Account->Advance Tab. I ran the command host scs.msg.yahoo.com and got all the IP addresses associated with that URL and did a check on the IP address I had configured and it was no longer in the list. I played around and replaced the IP address I had with a new one from the current list. Pidgin seems to like the new IP and stopped giving me the message that it was unable to connect to service but still didn't display my buddy list. As good measure I shut down Pidgin and restarted it and everything seems good now. Connect to Yahoo service again and able to access my Buddy List. Hope this works for you too. scs.msg.yahoo.com mail is handled by 0 . Imagine if the Declaration of Independence was written in "Word 1776." What are the odds that we'd be able to open that original document today? Great quote by David Egts, Principal Solutions Architect at Red Hat, Inc., in a interview on the WashingtonPost.com web site Viewpoint. He was highlighting the importance of not only Open Source but Open Standards in everything from business to government. There is a lot of talk of companies that are struggling through these rough economical times and the Open Source road maps that can help them through. Those exact "road maps" are also being explored for government implementation which I personally think is long over due. The discussion with David Egts was a great forum that allowed the public at large to ask direct questions. David Egts covers a wide range of topics. It's a good read. Suggest you go over to the web site and check it out. Ok, sensative subject I know. It can be tough to mention Microsoft and Open Source in a positive sentence that doesn't talk about one hammer on the other. However that is where we find ourselves today. In a blog post on MSDN blogs, Sara Ford the Program Manager for CodePlex which is Microsoft's open source project hosting site, talked about the CodePlex websites growth over the past year. In just about every category Sara touches on shows an increase of over 100%. This includes things like visits, unique visitors, and new projects. Maybe this will inspire Microsoft to invest more into their open source initiatives. Yeah, that was probably pushing it a little. CodePlex Weblog : CodePlex 2008 – A Year in Review. During this time of financial "belt tightening" we are all feeling the pinch and probably no one more than the IT organization budgets across the corporate map. IT is typically the first to get hit, and hit hard, by cut backs. It's during this time that CIOs and VP's who wouldn't have given Open Source Solutions much of a look start to turn to Open Source as some sort of magic bullet to allow them to get what they need and stay within budget. I wish to throw out these words of warning to both the afore mentioned group and the Open Source enthusiast who have been working to get Open Source into their environments and might be thinking this is the opportunity they were waiting for. Yes, there are financial benefits to having an Open Source architecture and those people who have one will be able to manage the rough waters moving forward a lot easier but if you have not already established this environment then chances are you've already missed the boat this time around. It should be made very clear that there is a cost to implement any environment, including an Open Source environment, and more so if you are attempting to replace an existing environment. For my fellow Open Source brothers (and sisters) who long to hear the phrase "let's move our environment to Open Source" please proceed with a great deal of caution. Make sure the spirit of the initiative to move to Open Source is one of genuine architectural decision making and not one of financial desperation. In the latter scenario, organizations have already conceded to needing to "cut corners" and see Open Source as a way of doing this. The message should be made clear that Open Source is not a corner cutting solution. Furthermore, there are no substitutes for best practice and common sense, so do not sacrifice your architecture for the opportunity to implement a piece of Open Source you've wanted to put in place, make sure it's put in place correctly. It will do more harm to your environment, and the efforts to establish Open Source as a better solution, if your implementation is done poorly and without enough forward thinking and ultimately fails. Where Open Source fits, IMPLEMENT! Accept there will be cost. Where Open Source needs to replace another solution, plan out the implementation carefully and try not to sacrifices any current functionality you may have now. Nothing replaces best practices and having clear, well defined standards. Recently I got my invite to try out the new Dropbox service. I am a long time Folder Share user and had heard some good things about Dropbox. I have to say, I am very happy with the performance of Dropbox and was even more pleased when I found out there was a Open Source Linux client. Figured I wouldn't be a good geek if I didn't do a quick install and see how it performed. Here is a video of that effort.